Tell me, how can you not want to dig into this deliciously colorful dish? The best part? It's VERY quick! Okay that's not the BEST part, but it's close! I had to buy FROZEN shrimp here in Indiana. The only fresh seafood they had was fish (blargh! ), crab, and some pre-made cake....patty things that disturbed me. After complaining to the boy about not getting fresh seafood I chucked two frozen bags in my cart and pouted awhile after coasting away to find the next items on my shopping list. There's nothing complicated about it. It's simple flavors. I finally get what the foodies on the Food Network always go on and on about. You know what I'm talking about. That fake "oh my this is so good" remark they always make over and over again. Then they go on to describe each thing and I get annoyed (mainly because I can't enjoy it with them), but I get it now. As you eat all different components in this dish it's an explosion of flavor! A simple garlic sauce, nice golden zucchini, cherry tomatoes that sweeten as you cook them, and the shrimp? Amaziiiinnnnng! I'll be honest, I had my doubts about my shrimp as we're in a landlocked state. Okay okay I'm going to start gushing, let's get on with it! Add zucchini in a single layer; increase heat to high and cook until bottoms are golden, about 2 minutes. Flip zucchini and cook until golden on other side, about 2 minutes more. Remove zucchini to a plate with a slotted spoon. Heat remaining teaspoon oil in same skillet. Add shrimp; sauté 1 to 2 minutes. Add tomatoes, oregano, salt and pepper; sauté until shrimp are almost just cooked through, about 1 minute. Stir in garlic and water; sauté, stirring to loosen bits from bottom of pan, until shrimp are cooked through and tomatoes are softened, about 1 to 2 minutes more. Return zucchini to skillet; toss and serve. NOTE: If you have a lot of liquid in the bottom of your pan you can add a little flour, turn up the heat to a boil then reduce heat and let it simmer until thickened. Add thickened sauce before serving for more flavor. 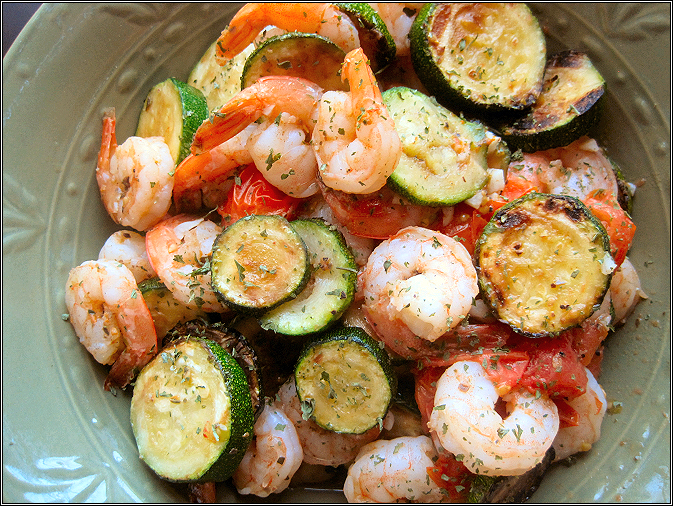 By using the smaller shrimp you will get more and make your plate appear fuller. *I am in no way affiliated with the websites/companies linked. I was not paid to use or advertise their products. I am not earning profit from linking the items. These are items that I personally pay for (WW subscription and produce linked) and will not be reimbursed. Are the points calculated for the new system or the old system? This is from 2011, so the old system. Thanks for sharing this recipe. Made it this afternoon and it was great. Looking forward to trying different variations of it.